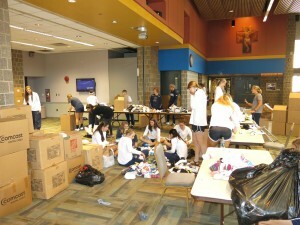 Some students from Villanova University sorting and packing new sock for the homeless for The Joy of Sox. A WORLD RECORD number of new socks were distributed recently to the homeless of the Philadlephia area. 15,120 pairs of new socks were sorted, packed and distributed to 28 homeless shelters in the Philadlephia area!! With the cold weather approaching the timing was perfect to get the socks to those who need them. The Joy of Sox, a nonprofit that provides new socks for the homeless, was supported by the Villanova University’s women’s soccer and volleyball teams as part of the university’s St. Thomas of Villanova Day of Service. Approximately 65 students and volunteers gathered on campus to sort and pack the new socks into boxes that would be delivered to shelters over the next few days. What a super effort by everyone involved. And the new socks on the street will go a long way to making a lot of homeless toes happy toes!